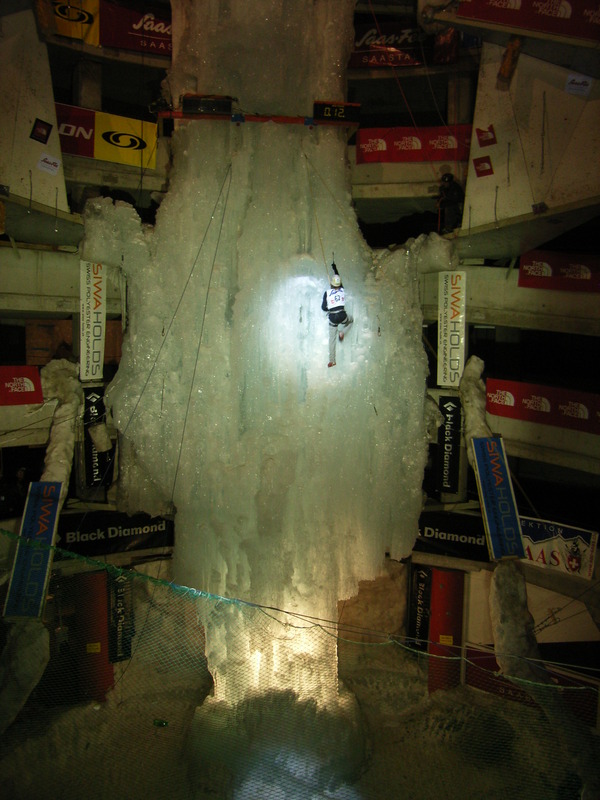 This year is the tenth time Dennis takes part in the Iceclimbing Worldcup at Saas Fee, Switzerland. It was one of his best, regarding the lead climbing and one of his worst regarding the speed climbing. But, he at least didn’t put an iceaxe in his leg this time. Tired from all the travelling Marianne didn’t climb the best ever, but still good enough for a 12th place in lead and tenth in speed. Here their story of a week of travelling with the Worldcup ‘circus’. Korea – Netherlands – Swiss in two and a half days time. The flight back to the Netherlands took forever. Back home we didn’t even have the time to eat dinner with my parents. They picked us up from the airport, we drank a coffee and we were off again. We picked up Odin and started our drive to Swiss. Completely jetlagged it didn’t matter it was already 03:00 in the night when we stopped to sleep. The next morning we arrived in Eptingen for a small training ses. This time it froze. The waterfall was semi-frozen and the slippery ground had turned into a solid layer today. Much better compared to two weeks ago. We warmed up in the routes on the left and went into the roof. The roof. It feels so good to make those moves. Let my muscles work, my body swing. This kind of climbing is what I’m addicted to. Tired, jetlagged but satisfied we drove on to Kandersteg to spent the night. Kandersteg is kind-of our ‘home town’. Since Dennis and I got to know each other we’ve always spent time in Kandersteg. It was nice to be there again. We got a special offer by a nice Dutch lady who lives in Saas Fee for at a about 30 years now. She and her Swiss husband run an apartment complex. Azur it’s called. And it was so welcome. The previous nights we’d spent in the van. No heating and all humidity freezes to the windows. Not the best way to prepare for a Worldcup. Dennis wasn’t feeling very well and I was really afraid of getting the same Korean cold. The rain during the second day in Korea didn’t help… The organisation there didn’t allow us to sit inside or go back to the hotel and as it was a 40min drive to the hotel it wasn’t realistic to walk. We spend the whole day in the cold and rain watching the others climb. So an appartment in Saas fee with a 10 minute walk from the structure is much nicer. It’s already 3 years ago since I won the Worldcup speed here in Saas Fee. Last 2 years I was so eager to win that I punctured my leg with a speed tool. This year feeling weak from the cold I didn’t have much more expectation compared to the previous years. But after 10 years of competition climbing 10 years since my first IWC in Saas fee I feel a lot more relaxed. The competition stress is no longer picking on me. Also the game changed a lot. 10 years ago the most of the wall was ice and icecovered structures. With only a couple of mixed moves in between. Still climbing with heelspurs and gardening gloves. After a long night of coughing sneezing and keeping Marianne awake I was feeling miserable. So when Marianne left at 7:00 to be on time in the Isolation I went back to bed. 20 minutes later the alarm told me it was time to leave for men’s speed qualification. We started at 8:00, the same time as the Women Lead qualification. After the warm up run the best of 2 runs would count as result best 18 men go on to finals. I forgot the cold and climbed an ok 10 sec run and a 9.27 sec. run, fast enough for the finals that night. Marianne started on the quali route; an easy enough start for a “real “ iceclimber. She climbed steady and confident. Locking off where other girls figured of foured their way up. A bit too slow in my opinion. So I kept on yelling to keep pace keep on moving go GO go! Marianne kept on progressing very well. With only one minute left on the clock she started to excellerate even more making the last 3 drytooling moves and clips she went for the second last icebarrel and timed out. One more move from the finish. After Mariannes climb we walked back to the appartment talking about our climbs. In the aparment we made some time to analyse the video-footage to see what points could be improved. I prepared for my lead qualification, placed my new Krukonogi Giraffe picks with side cheecks and re-used some of my moms Tennis Griptape on my tools. The Routes in Saas Fee are made with real rockholds for the last years now. These pieces of granite are realy difficult to ”read” you can tell by their position where the pickplacement is supposed to be but you’re never sure. So during the route previeuw I checked the position of the holds figured the route was not too hard but with only 4 minutes to climb it was going to be a speed race. My headache is slowly fading away after making some ‘jumping jacks’. My name was called out and I had to prepare for my climb. I bent forward to ajust the Boa-wheel of my Rebel Ice Scarpa’s. And the little dwarf start banging its hammer inside my head again… So I made some more jumping jacks to throw him off his feed and clear my head for my climb. I place my feed high on the pillar and took my tool from the blue zone. Reached as high as possible in the log. Swinging my tools in the next log while using my hand on the rock hold to make more height. The start is not very difficult but the rock holds make my moves insecure and slow. I have to ajust my feet a couple of times inbetween the moves, loosing time. After 2 minutes I’m at the end of the first wall. Traversing to the left. Marianne yells I have 1:30 min left. I increase my speed. Climbing less static I make some quick dynamic moves loose my feet and move to the ice barrel. Marianne yelled 30 sec left!! I replace my feet as quick as possible pull hard form the ice barrel to a small sidepull on the final wall and made the clip. In the last second with a ‘nothing to loose atitude’ I jump for the last golden hold on the wall. I hit it in the perfects pot but loose my feet. Swinging around I loose the grip on my icetool and come off the wall. That’s it I guess, it’s not enough for the Semi’s. But it felt good since I could give all and pushed my limits. Alexey told me later he liked my “Stallone” (referring to the move in the Cliffhanger movie where Silvester Stallone is hanging on one arm while soloing) It cheered me up and gave me some more hope for the Semi’s. 19:00 Marianne is making the warm-up run for the Women Speed finals. After 5 years of competition climbing Marianne is getting good at speed climbing (suprising her self). She already climbed a new PR in Korea and now in Saas Fee she starts in the Finals. Unfortunatly she falls down in her first run so no time set. So the she decides to go slow and steady the second run to set at least a time. With 22.23 seconds a slow but steady time. The third run went very well and she climbed a 16 second run that put here in 10th place. After the womens Speed finals I was the first to warm up. I made a good warm-up with only 10.22 seconds on the clock. I feld relativly good and was happy with my warm-up time. So the first final run I went full speed but fell off in the top part. So the second run I went slow and steady and climbed a 16 second run. The last run I went full speed but fell off again and was really disapointed with my final result. But with the Semi final in view the next day I tried not to be bothered too much. I could sleep in. Well.. I didn’t realy sleep last night; coughing and turning so a bit longer laying in bed feld good. Marianne had to be in Isolation a 8:00 for the Semi finals. I took out the Laptop to take a look at the live stream. Most girls climbed through the first mixed section and stranded in the traverse. Marianne was looking a bit nervous at the start she started climbing very slow and static making the long powerfull moves but only after testing the hold and re-testing them several times. This took a lot of time so when she finally started the traverse to the arch she was halfway through the time. When she started to climb the vertical log it even went a bit slower. The thick Mixed picks didn’t want to penatrate the hard wood. So she was swinging hard to get them in. But even then she didn’t seem to trust them at all. She was inching here way up the log. Making slow process and already in here last minute she clipped the draw half way the log. She made some more moves and kept her feet in the log while the wall of the arch was already within reach she didn’t swing over. She kept on climbing to the end of the log. Couldn’t get her tools in and suddenly slipped while trying to clip the last draw in the log. Done… unhappy and disapointed. After lunch it was my turn to climb the Semi’s. I just made semi’s so I was the first one to climb. During the route preview I noticed some long moves I thought would be really hard. I didn’t feel a lot of pressure since I didn’t feel like I had any chance to make it to the finals. So I figured I would try to climb as fast and “on the edge” as I could. I started with some efficient moves from the log. The first mixed section contained so many holds; I was affraid they would be all bad. So I climbed much slower that necessary. Starting the traverse… still climbing cautionous arriving at the strange side-pull move. Form this side-pull you had to move over to the Icebarrel. I felt the hold was really bad and that I couldn’t make the move so I tried to move back thinking I might be able to skip the hold. But it suddenly seemed way too far. I move back into the side-pull and dicide to jump to the Icebarrel. Fixed on the blue-painted Icehole I jump; my axe pops off the side pull my feet fly through the air but I’m on the Icebarrel! I try it with my hand, put the steinpull in again. Weight it, test it, test it again and decide to go for it. Reaching carefully to the next hold I hear I have only 30 sec left. I made the next hold clipped the draw… Marianne shouts the count down 10…9! I try to re-adjust my feet as quick as possible slip again and decide to jump for the Icebarrel. I jump and it feels like flying already back to the ground but instead of the rope chatching my fall I’m stuck in the icebarrel with my left tool. Full of Joy I time out on the icebarrel while hanging on one arm milling my feed around cheering and waving with my other axe so happy I made the desparate jump to the icebarrel. After me Kevin makes it only one move higher then me. During the time one by one fall off under me. So I’m still in 2th place after 9 climbers… But the final 9 are the best climbers from the previous round. Watching the others climb is a mental game: they have to fall off to let me go to the Finals, but they are good and deserve there finals places too. In the end I ended up in 9th place. No lead finals for me in Saas Fee. Still one more chance this season. Within less then a week time the final event will take place in Rabenstein, Sud Tirol (Italy). In the mean time we will spent some days training on the structure and at Angelika’s home spot Iseo. Looking forward to the Italian sun.